“The Beach Party” is a simple definition of what you should expect from a day on a beach in one of the most preserved areas on the island in Domaine de Bel Ombre. We know that you will drive some distance to meet us, and we understand that your day must be filled with great music, drinks and games! PURE is a leading entertainment brand located in Mauritius. During the past years PURE has built concepts for the high-end market in the most beautiful resorts and venues across the island. The musical direction of our events is focused on magnetic and dynamic sounds which will make you dance from start to finish. Our commitment is to spread the positive vibes while creating unique and magical atmospheres. Nestled in the unspoilt South of Mauritius, the C Beach Club is the ultimate combination of beach, nature, relaxation and adventure. Explore this destination within a destination, inviting you to immerse yourself in the C pool or the beautiful lagoon. Turquoise shades, calm translucent water, gentle ripple of waves, infinite beach, 27 degrees under the coconut trees…who could resist jumping in the water? The VIP corner will offer privilege access to chill-out and covered lounge areas. PURE at The C Beach Club will accommodate a maximum of 700 selected guests to create exclusive intimate vibes. Our headliner will play an exclusive hour set. […] producer […] has established himself as one of the most sophisticated and emotive producers in electronic music of the last decade, with a body of work and a sphere of influence that belies relatively short time in the spotlight. Whether it be his sensual, hypnotic take on house music, his deeply textured techno or his wondrous ambient material, his work is always touched with a magic and emotion that few rival. As per our policy we never apply hotel rates on the menu. All items are priced according to regular bars price range. Ciroc, Möet & Chandon, Jack Daniel’s Tennessee Whiskey, Gister, Monster, KOZÉ, TerrOcean, Les Tipis de Mare Longue, VDTech. Exclusively on pure.rezobooking.com and at the door. 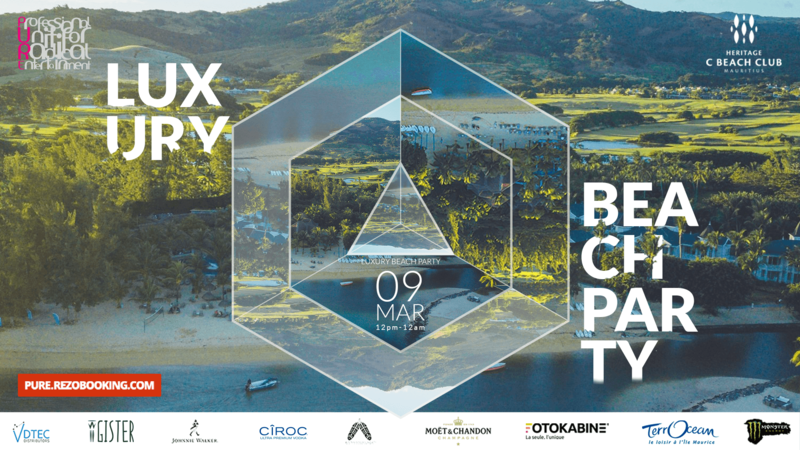 We do not sell any paper tickets, go green Mauritius! There will be no Flash Sales and no discounts during the promotion. Only 700 tickets are available on sale. Tickets bought early are less expensive. Table packages are on pre-sale basis online and we don’t guarantee any availability for purchases on site. Special accommodation deals are available at Heritage Resorts. Please contact the Domaine directly for additional info and bookings. 1) This ticket cannot be replaced if it is lost, stolen or destroyed, and is valid only for the Event for which it is issued. 2) This ticket is not transferable or redeemable for cash. 3) Reproduction of this ticket is not permitted. 4) Unless indicated otherwise, price includes all applicable sale and use taxes and/or cash discounts (if available). 5) This ticket is a revocable license and the Management of PURE Management Ltd reserves the right, without the refund of any portion of the ticket purchase price, to refuse admission or to eject any person who fails to comply with the rules of the venue and applicable laws. 6) Unauthorized or unlawful resale or attempted resale is grounds for seizure and cancellation without compensation. 7) No refunds/exchanges will be applicable once this ticket is purchased. 8) The minimum age for entry to the Event is 18 years. Any purchaser of the ticket who is found to be less than 18 years of age shall not be allowed entry to the Event and no refund shall be applicable in such circumstances. 9) The ticket user assumes all risks of personal injury incidental to the Event, whether occurring prior to, during, or subsequent to the Event. Ticket purchaser bears all risks of inclement weather. 10) This ticket may not be used for advertising, promotion or other trade purposes without the express written consent of PURE Management Ltd.
11) The ticket user consents to use of his/her image or likeness incidental to any video display, transmission or recording of the event by PURE Management Ltd, the venue or the artist. 12) The use of cameras, video or audio recording equipment is prohibited unless otherwise indicated by PURE Management Ltd, the venue or the artist. 13) By participating to this event you accept to be photographed and filmed. 14) WARNING-EXCESSIVE EXPOSURE TO LOUD MUSIC MAY BE DAMAGING TO YOUR HEARING.